If you need a caterer then these are your guys. Everything tasted beautifully and the staff were more than helpful right from the start. A great service and highly recommended. Yes my party went really well on Saturday night, the team worked really hard and I appreciate all they did during the party. The food was really nice and everyone enjoyed it! Thanks for making the 28th memorable. I hadn’t told the guests about a hog roast so was a great surprise for everyone. The staff were friendly and very professional and a great night was had by all. The service and food was fantastic. We could not fault the lads that came to us. Hi, would just like to say that the guys at our wedding were fantastic, professional and engaging. The food quality cannot be faulted and we just want to say thank you so much. Thank you for providing the catering for our event. In all honesty I was so busy leading up to the event that I didn’t have much contact. Normally I am really prepared but this time forgot to think about people with special dietary requirements. The food was delicious. My server was so friendly and helpful and had thought of everything. Everyone commented on how nice the food was. Unfortunately I was unable to attend the event due to a prior appointment, however the feedback I received from the staff was all positive. The food was delicious and plentiful. You are fantastic! We were late back but chef kept the pig as long as possible so we still got to see it in all its glory. Quick and efficient service and everyone loved it – not a scrap left in the morning! Everything went very well thank you. The food was excellent and everyone had enough to eat- in fact all positive feedback from us. Communication was also very good on the day. Thanks so much for catering for our party last week. Our original caterers had let us down at very short notice, so we were relieved to find someone else available. The food was delicious, the staff were well turned out, friendly and efficient, tables etc looked very professional, and they left no mess! Perfect! Sorry for the delay in responding, it’s been a busy week. We had a fantastic day and everyone enjoyed the food. Your team were all very friendly and accommodating, so please send on my thanks to them. We shall no doubt be using you again in the future. Our Event was a success thank you ! . We had some good comments about the food on the day and afterwards . We had a good choice of food and everything was set up and laid out perfectly. We would certainly consider using you for future events. Thank you so much for Saturday, everyone loved the food! No negative feedback at all it was all positive. The event was a great success. Your staff did a fantastic job in setting up – despite the rain ! Such a friendly team and the food was fantastic ! It’s been a pleasure to deal with you and I thank you for providing a first class service ! All was great, there was lots of pork, Mac & Cheese! All said the food was good! If we get the chance to hold another one, I’ll be back in touch. We had a fabulous evening. Although we didn’t have that many guests, they all went away with boxes of left overs which they loved. Perfect weather, perfect food, great night! Thank you. We had a fantastic day thank you. Your team were great and the food went down a treat. Everything was cleared away and left tidy. It was thank you, it was great! The food was lovely and the hog roast burgers went down a treat. Everyone who attended thoroughly enjoyed it! Thank you very much! Thanks for getting in touch. The event was a success! The food was all great and delicious! I’d like to thank the two guys who were there on the night, they were absolutely great, really helpful and professional and produced some really nice food that our guests loved. The guys provided a great service and we will be touch about next year’s event shortly! I was really pleased with how the catering went at the event, the two whole came to cook for us did an excellent job and the food they served was delicious. I really appreciated how easy the organisation and communication was and how easy going Alex the chef was. Yes all good no bad comments from the guests, all seemed happy We will be definitely be using you as our regular hog roast company. Yes all went well thank you! Service from yourselves has always has been fantastic – thank you. I have had loads of great feedback from everyone that attended. It was very well received. The vegetarians all loved the halloumi! Would definitely recommend you to a friend! We had a very good party thank you. Cliff was great and the food was very good. Thanks for helping our party go well. Yes it was a great success thank you, everything went very well. Our evening was wonderful. Thank you for being a part of it. Everyone said how good the food was, and your staff, Alex and the girls were delightful. We thought food was excellent, friendly chef! And would recommend you. Everything ran really smoothly on the day, thank you so much for the tasty food we had lots of compliments on the catering. What a lovely meal we had. Whole roasted hog with all the trimmings! My daughter would like to especially mention the apple sauce which she couldn’t get enough of. Thank you very much for everything, will definitely be using your services again at the next opportunity and recommending you to everyone in the meantime! The guys did a great job, they were nice to work with and I would definitely use their services again in the future. Yes Martin is very good and always ready to serve on time and very polite with all the guests. My event was wonderful thanks to your professional service. Martin contacted me in a timely manor, turned up when arranged, cleaned up well afterwards and was endlessly helpful with guests and leftovers. Our event was a huge success thank you and we also received many positive comments about the food provided by Spitting Pig North Wales. Martin who was our chef arrived on time and was very friendly and accommodating to our needs throughout the day. I will definitely be recommending your company to friends/family and colleagues. Thanks for the email the event went well and was eagerly received by everyone on site. The aroma of the hog roasting got everyone’s mouth watering. There was nothing but praise form the guys on site, they were impressed with the crackling and the salad that was provided, the element to receive the most praise was the homemade coleslaw. And we would recommend you for future events. Martin was a fantastic host. Will use your company again for future events. It was absolutely fantastic! Thank you so much the food and service was amazing and everyone commented positively. Martin was absolutely great, arriving in plenty of time and setting up quickly. He was helpful throughout and nothing was too much of a problem, great food, great service and everyone loved it. Please pass on a massive thank you, I would definitely recommend to anyone in the future. Everything went really well thanks and Martin and Curly were fab and made the evening. The food was superb and service faultless. Many people have asked me for details so that can’t be bad. Thanks again. Our event was a great success, thank you. 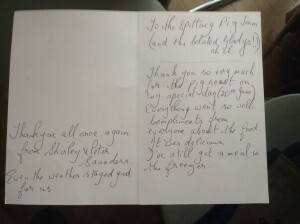 We were very pleased indeed with the service from Spitting Pig North Wales. Diane and her assistant (whose name I have forgotten – sorry) were very pleasant, professional and competent. They arrived when they said they would and were ready to carve the cooked hog at the time we asked for. Everyone was very complimentary about the quality and taste of the meat, which was perfectly cooked. 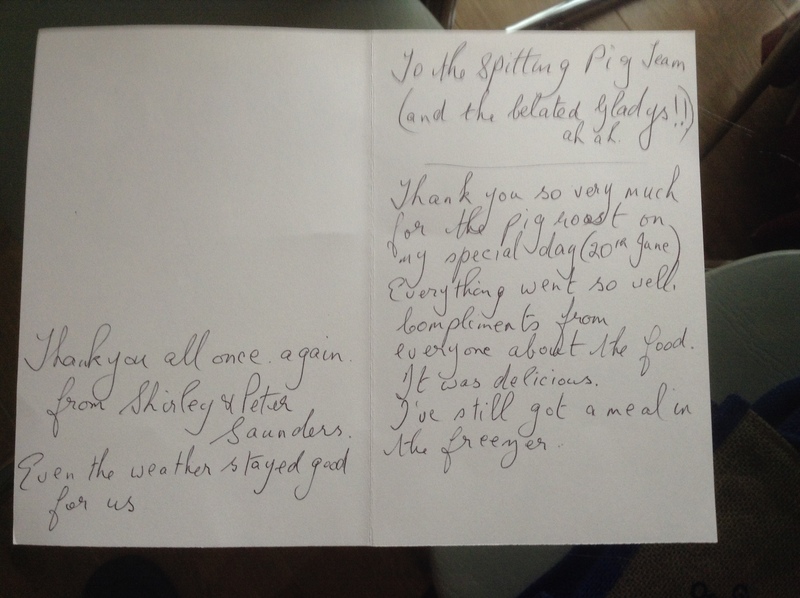 We would not hesitate to recommend Spitting Pig North Wales, and we hope to use you again in the future. Just wanted to say that the staff did a wonderful job, they were fun and friendly, and everyone commented that the food was one of the tastiest hog roasts they’ve ever had! Thank you all so much for helping to make our wedding a great success and make all our guests happy! Party went very well thank you, Martin looked after us very well and the hog roast was fantastic. Would recommend your services to everybody. Sorry for the delay in replying have just returned from a break. First may I say thank you for the support that we had and have always had from Spitting Pig from start to finish flows with great ease and removes a great pressure off my shoulders when organising a major event for the school. Many thanks and hope to use you again next year. On behalf of everyone here at Technology Supplies I would like to thank Stephen and everyone at the Spitting Pig Company for helping us host a very enjoyable event. In particular I would like to thank both girls that attended on the day – they were both a pleasure to deal with, the service provided was second to none and they made sure all of our guests were kept happy and well fed. I would have no hesitation in recommending the Spitting Pig Company to anyone thinking of having a Hog Roast at their event in the future. It was wonderful. Martin was excellent. It was such a joy not to have to cook and clear up and everyone really enjoyed the meal. 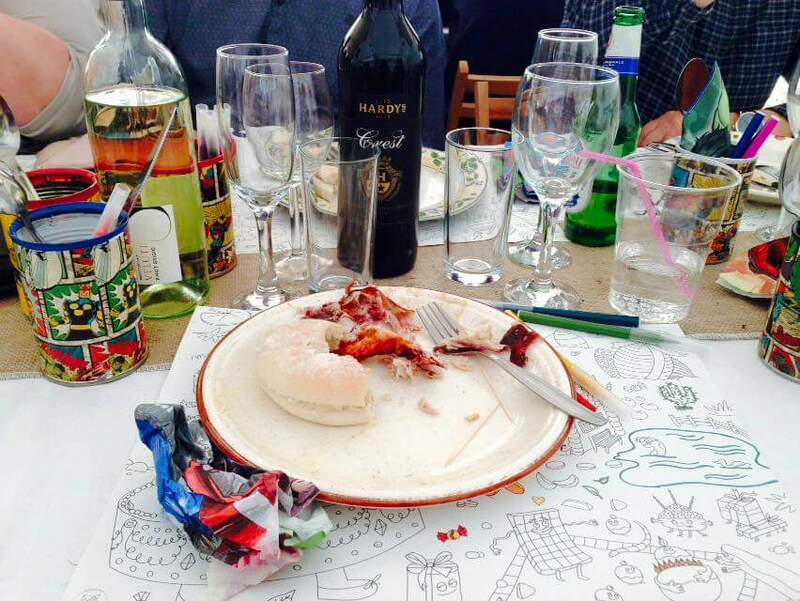 The roast potatoes were very good indeed with our obligatory hungover brunch on Sunday! The Hog roast was fab – Martin arrived at about 8.00am and set up shop. He and Angela were very friendly and accommodating. The meat was lovely and everybody commented on it. Martin left us with the remains on a large tinfoil platter which we enjoyed the day after. I would highly recommend Spitting Pig and Martin to anybody. I would like to congratulate your team on a super service from ordering to communications it was very smooth. On the day the two ladies were helpful polite and well organised, I had no need to worry. I would use your company again and recommend your company to my friends. The Roast Pig was delicious and a very good portion served to everybody some even went back for more, I am not sure where they put it! Finger licking good. The meat was delicious and the service was great, so we are very happy with everything. Martin and co were very helpful and very professional in their approach, they cleared away everything without any mess making it much easier for our party guests to enjoy themselves after the food was served. My guests commented about how clean and organised they were and impressed that they cleared everything away. I would recommend your company and have done so to my friends. Everything was spot on thank you! See you next time!! Apologies for late response for feedback on our event held on 14th November. Harry did a wonderful job, was very polite and produced a well presented meal that was greatly appreciated by all who came. Your lads also cleaned up as promised and left it all clean and tidy much to the disappointment of our dogs who had to make do with licking up small drips off the floor, great job. Our wedding was a huge success and the guests loved all of the food, the spit roast pig was a big hit in particular. Martin and the team were fantastic and helped us pull off our big day without any problems, please pass on our huge thanks to them all. The Hog Roast was a hit.. everybody loved it, staff were excellent and very professional. Thank you for your email, and I do apologise about the delay in my reply. What can I say about Martin and his lovely wife Diane? In short, they were absolutely fantastic. From meeting them in March to discuss the menu and go through everything, they put our minds at rest immediately. Warm and friendly, it felt like we had known them for years. Fast forward to the week of our wedding and we met with Martin and Diane again to finalise the arrangements, again it was like meeting old friends for a coffee. They even put up with my Dad and brother who had travelled up that day and were a little merry for the train journey. My brother is an exceptional chilli head, and Martin promised that he would sort out a chilli sauce for the hog roast baps he would be serving. Finally the 18th September arrived and things couldn’t have gone better. Martin arrived with his lovely girls at about 10.30am when we were setting up the venue. We were offered the chance to see our pig or ‘Yoda’ as we had named him, and what a pig he was, was a tight fit in that cooker! Martin was amazing and liaised with the venue staff of what he needed and where to place the buffet. The wedding party at this point had to leave, but Martin reassured me that when we returned, we would be in for a treat. We arrived back at the venue after the ceremony to the delicious aroma – even for a vegetarian like me – of roasted Yoda. It looked simply amazing. More platters were brought out at serving time with mountains of mouth watering Thai, caprese and pasta salad and another huge serving dish of crispy roasted spuds. Then, it was the pig’s time to shine as the cooker was opened, showcasing a perfectly cooked, juicy fleshed and crunchy crackling hog. The food was just incredible and everyone commented on how moreish and delicious it was. We literally had people raving about the hog and sides all night! My brother, who had previously been promised a chilli sauce worth his while, was certainly not disappointed by Martins offering. We vegetarians were impressed too, with the hearty Mediterranean tart that was on offer – simply lush! Everyone had plenty to eat and were stuffed to the rafters, when Martin and the team put everything left together into foil platters and left them pride of place on the buffet tables, whilst they quietly tidied up and slipped away leaving us to enjoy the rest of the evening. I simply can’t thank Martin and Diane enough, they are an incredible team and the food was divine, people are still talking about it two weeks later. I have recommended him to anyone that will listen and will certainly instruct his services in future – we have some big birthdays coming up in the next 18 months! I was absolutely delighted with the whole set up provided on Sunday the 13th September. Angela and Martin are two of the nicest people one could wish to meet.The whole occasion was so professional. All our guests were most impressed. I would like you to pass on our sincere thanks to both Angela and Martin. We used your service at Kingsmead school on Friday 4th September. The service provided was excellent and may I add that Martyn and his wife were true professionals, and are a credit to your company. Our event was a great success thank you. The pig was large for our numbers (everybody took a good doggy bag home!) but tender and succulent: many thanks to Martin and his helper. We much appreciated the quiet and professional way that they tackled the cooking and serving of “piggy”! Please make sure that our thanks have been passed on to Martin. We will have no hesitation in recommending the Spitting Pig Co. to anyone who enquires in the future. It was excellent thank you – super service. All very good indeed. Many thanks. Lots of people asked for your name. All went to plan and Martin & Angela looked after us well. Food was delicious…plenty of it. Made our day go with a swing. Everything was set up and cleared away as said. We had a fantastic day at hafod farm on sat and the hog roast was amazing! They arrived and set themselves up outside as best they could despite the slightly rubbish weather (it was very windy!) They were extremely polite and helpful, whilst also being flexible and understanding about the serving time, we were running a bit later than expected! Everyone commented on how tasty and beautifully cooked the meat was and the portion sizes were very generous! There were just over 100 people and they served them all quickly but their manner with each guest was warm, friendly and relaxed. We couldn’t recommend them enough! Sooo many people asked us for contact details! A friend of our family who had provided the hot vegetarian dishes for us, used to cater for the army so has done many large events and he was massively impressed with the quality of the hog roast and the cooking techniques involved. It was one of the best ways to feed a large number of people for a reasonable price and have them all happy and satisfied! An easy, reliable and professional service from booking to eating! And the leftovers have already made amazing cold butties, curry and stew! We had a wonderful party yesterday, everyone of our guests were full of praise for the excellent quality of the food. The lamb was delicious. We were delighted with the whole service. Martin and Angela were efficient and very charming and helpful. I know a lot of your cards were taken home and we will recommend you. Well what a first class service you deliver from making the inquire through to the collecting after the function. Very professional from start to finish. The driver that delivered and collected was most helpful and polite throughout and was on site on time both at the start and the collection allowing for traffic he explained the operation of the pig roast and was very proficient and a superb ambassador for the company. Thank you again for the fine service. Sorry for not getting back sooner. I would like to say what an excellent service Martin gave. The food was delicious and his flexibility and service was lovely. Feedback from all the guests was only positive. Please pass on my thanks to him. Many thanks for doing such a fantastic job with our pig – it was the centerpiece of the whole wedding, was absolutely delicious, and we’re still working our way through the last of it! Just wanted to express my thanks to you and your team for the splendid service at last week’s Plantworx. Having high quality stand hospitality makes a real difference to the overall visitor experience and helped the Cat team create a really welcoming atmosphere. Your team was professional and unflaggingly friendly, even during the inclement weather of Tuesday! How you kept up your energy levels, particularly considering your daily commute from Llangollen, is astounding; pigs may not fly but Spitting Pig is certainly super-charged! Thank you for all your hard work and I hope to work with you all again soon. We were absolutely delighted with the food and the service. Everyone raved about the pork!! No wonder it all went! And mum said how nice and personable you both were. I love my food and it was ace to hear you share the same enthusiasm about your food. Thank you very much indeed guys! Yes! We had a very successful family party and Martin (head chef) was extremely professional and helpful! The food was set up on time and cooked well with plenty to go around everyone. Very polite and after clearing away he left without any fuss so the party could continue without any interruptions. The food was as stated, the pig was brilliant but the chicken was my favourite. Martin and his team did brilliant at carrying out such a big event and I would like to thank them on behalf of me and my guests. I was really pleased with the quality of food and service from Spitting Pig. The whole group thought the food was fantastic and it was great to have all set out and tidied away for us. Plus the ladies serving were really nice and added to the event. A great big thankyou for the hog roast at Trevor Hall for my 40th birthday party. It was fabulous all the best. Food was absolutely delicious on Saturday night. We’d like to say a big thank you to Martin and his team, especially for braving the elements to provide us with a feast fit for a queen. The hog roast in Bebington was great thanks. People enjoyed it and how stress free (for me) it was. I wouldn’t hesitate to recommend you to friends, and will use you again should the opportunity arise! Just a quick note to thank Martin and the team for a great day yesterday. Very professional, with nothing too much trouble. I hope they enjoyed their time at MoneySuperMarket.com as well. The guys that came to arrange our hog roast were excellent. Very friendly, open to discussing our requirements, and listened to our comments. On the day, they turned up promptly, set up quickly and were friendly to our guests when serving. The hog roast was delicious and lots of people commented on it. We would definitely book again for another big party and have no hesitation in recommending this service. Just a quick line to say thanks for the Hog Roast on Friday evening at school. Martin and Angela were a great team and everyone was very complementary. Jo and I wanted to thank you for the amazing job you did at our wedding back in April. It was the first hog roast that we’d had and it lived up to all our expectations, the salads and extra bits and bobs were lovely and the pig was delicious! You really made our day especially being so incredibly efficient, to this day I don’t quite know how you managed to get through so many people in such a tight time frame, something about being professionals I guess…! We just want you to know that all your effort was really appreciated and we wouldn’t hesitate a moment to recommend you to anyone, everyone there really appreciated your efforts and you really made our day. I’d like to compliment your chef, Martin Anderson, for the excellent service he provided on Sat 20 April, at Walton on Thames. The food was outstanding; everybody enjoyed it and Martin carried out his duties in a highly professional manner ensuring everybody’s needs were met and indeed he exceeded all our expectations. I cannot praise him enough. Such a commitment to great customer service is to be commended. You can be sure that I will use the Spitting Pig Co, for any future events I have, and will be recommending you to many friends and work colleagues. I just wanted to drop you a quick line to say a massive thanks for making our 50th birthday celebration such a memorable event. You and your staff were fantastic and met every challenge we threw at you. All our guests were so impressed with the food and your presentation. Fantastic mate, we will be back for more………….as will many others from the comments we heard. Thanks again, you are a star. We were so delighted with Martin (Anderson) from Spitting Pig North Wales. As we were holding a corporate event you can imagine people always like to express their views and I’m delighted to say that people could not have been happier with the service that Martin and Sharon (Martin’s assistant) gave. They were friendly, helpful and most of all professional. We had a brilliant day. Thank you so much and look forward to having you again at our Kidder minster Office on the 4 October. It’s not every day that we book professional caterers so we can’t pretend to have experienced all of them but judging by last night i’d say its fair to say you’re one of the best caterers about. Guys, absolutely loved the catering couldn’t get enough of it. The pig, the lamb, the starters, desserts, the lot, it was all so bloody good! Waitresses also did their job very well and all round there wasn’t anything that I think you could have done better. We were impressed with Spitting Pig because not only was the hog roast a welcome addition to our wedding but they also have the best staff and it’s very easy to get along with the Spitting Pig team, they don’t mind helping you with event ideas even if you’re ringing up every other minute as i was! An email of thanks to your company, we don’t have a bad word to say. Customer service has been second to none from the very beginning, our chef didn’t once shy away from talking to us infact he was always happy to discuss the event and bounce back menu ideas with us, so we were very confident about the day because of our pleasant experiences before hand and it turns out we were right to be confident because the chef, his assistant and all the waitresses did a remarkable job. Quite a few of our guests arrived late and so we changed the serving time at the last moment but it wasn’t a problem for the chef and the food came out perfect despite the late change. Hey guys, can’t think of a word to describe yesterday other than amazing! The hog roast with the crackling and succulent meat really was as advertised and we’d probably be selling you short by saying you did just a good job, because it was so much more than that. Staff were friendly and perfect too. I think everybody loved the hog roast, haven’t spoke to a person yet who didn’t like it and my sister also said how good her vegan replacement dish was and reckons it was better than most upper class restaurant stuff. So I just wanted to let you know that we were over the moon with your catering and if we had a party every week we would book Spitting Pig every week!